River is getting so big! She is now 8 months old. She looks just like her daddy, Angus! Click on any picture to see pedigree. Also after going to pedigree or show picture click the "back" button to return to current page. Welcome to our website. 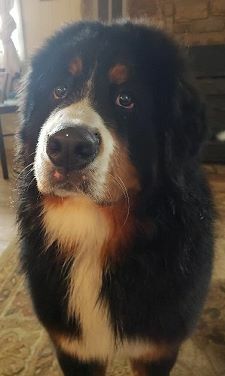 I am Susan McCulloch and along with my daughter Whitney McCulloch Brandon, we have had Bernese Mt. Dogs for over 28 years. We fell in love with this breed when we first set our eyes on these beautiful dogs when we were in Germany. We brought our first dog, Petra, back to the states when she was 12 weeks old, that was when we fell in love. We sent her pedigree back to Germany to get a male and about a year later we were given Phlip. The rest they say is history! 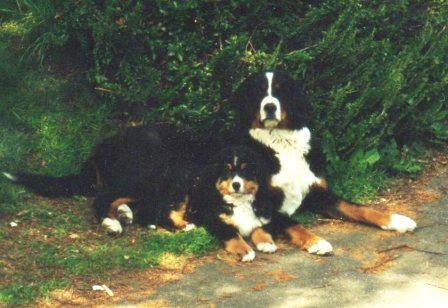 My daughter and I have been raising, loving, training, breeding and showing Bernese since 1992. I am a current member of the BMDCA. Please enjoy our website as we share with you our love for this fantastic breed. They were best of friends!